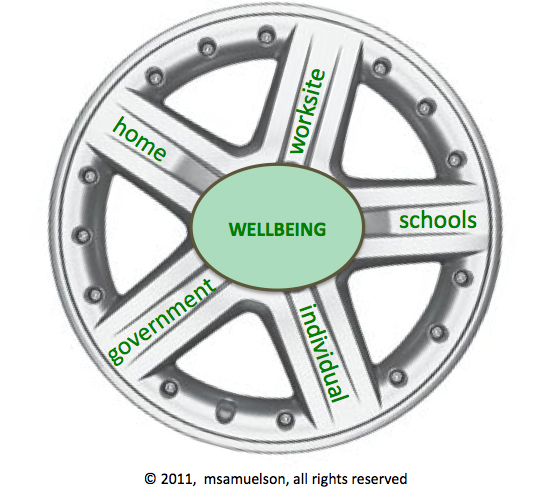 Of the five sectors that influence objective health and subjective wellbeing (see illustration, below), the worksite—as a primary and singular focus—ranks at the bottom of importance when it comes to lifelong impact. Please understand that rank-order separation is razor thin and I am speaking in relative terms when I say the REAL challenge. 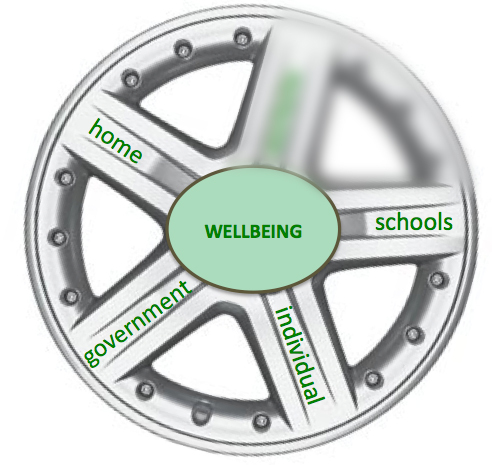 When it comes to facilitating and promoting objective health and subjective wellbeing all sectors are critical and there are challenges regardless of the venue or vehicle. Government policy, worksite culture, school curriculum, home environment and individual choice each present challenges and opportunities. However when talking about maximizing whole person health, each spoke must work in consort with each other if we are to have significant and meaningful change. The spokes are both independent as well as highly inter-dependant contributors to personal happiness and social contribution. For the purpose of a short essay, I’ll simply refer to “Worksite” as one sector and lump the other four into what I’ll call “The Other 16 Hours.” Longer dissertations on the subject can be found in my past writings. At least, that’s how I defined “wellness” during my tenure as the Founding CEO and President of the Health & Wellness Institute. My guess is that each person reading this essay has their own variation. At any rate, now you know what I mean when I use the word. And, yes, I know, COMPLETE actualization is not likely to happen for most of us in this lifetime. It is the continuous progression of incremental (mostly small) improvements that we seek to achieve…and, particularly important to the Joe Friday CFOs, measure. So, how are we doing? Ah, yes how ARE we doing? Short answer: As an industry in toto, nobody really knows. 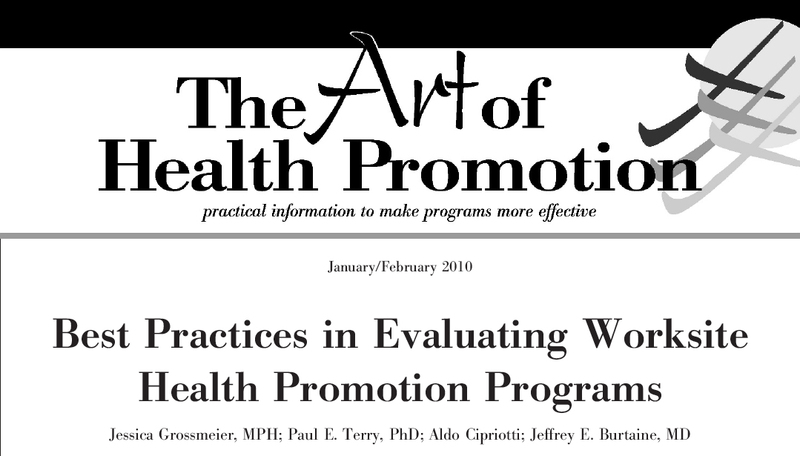 Let me pull three quotes from The Art of Health Promotion publication, January/February 2010, “Best Practices in Evaluating Worksite Health Promotions Programs. If you have read this article, I encourage you to read it again. If you have not read it, read it. In fact, if you don’t subscribe to the American Journal of Health Promotion, I encourage you to do so. Pretty hard to be in this industry or to intelligently comment on worksite health promotion without keeping up with the research. It goes on to talk about best practice models, programming criteria, expected outcomes, evaluation protocols and how to use champions, evaluation, and budget placement to sustain (gain) stakeholder support. Like I said, great article. 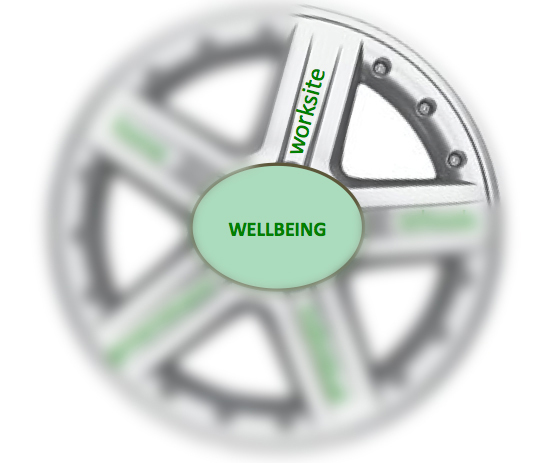 Okay, back to the question: When it comes to worksite wellness programs, how are we doing? I’m a pretty easy grader so I’ll give equal weight to both effort and execution. And…here’s the disturbing news…from my perspective this is the highest scoring sector of the five. ← 2nd Key Observation: Think Like a CFO…Show Me the Money!